RI Convention in Seoul was a grand affair, with over 40 thousand registrants from 120 countries, but the spread-out city of 10 million people meant long journeys to Conference morning and evening. I acted as moderator for two breakout sessions – on how to organise a VTT for maternal and child health, and on sustainability – what does it mean ? Both were well attended (VTT about 100+, Sustainability about 150) and the feed back was good. A number of important contacts have been made –the panellists were exceptionally good,- this made my job easier. Our panel members and the audience supported two new ideas put forward – these are the concept of VTT plus and Rotary Maternal and Child Health Ambassadors in Districts. They also supported Calmed concept with great enthusiasm. VTT 1 –where a team of 3-4 Obstetricians visits an area of need and trains a group of professionals (doctors ,midwives and nurses) in the emergency care of pregnant women and new born babies ,using modern methods of knowledge and skills transfer. VTT 2 facilitates training the trainer model – a team of 5-7 Obstetricians train about 20 to 25 master trainers (middle grade obstetricians who pass knowledge and skills tests) who then train a group of basic trainees( doctors, midwives and nurses) . VTT returns twice to refresh training, but local Master trainers continue with ongoing training cascades for all related professionals in the target area. VTT 3 (VTT plus) is as above plus additional responsibilities for master trainers undertaking audit in the form of maternal Death Surveillance Response (MDSR) in partnership with Government – analysing all maternal deaths and making recommendations to avoid preventable maternal deaths. The expectation is that the Government in partnership with other stakeholders will take corrective action. Local Rotary (District and Clubs) will have coordinating roles. Rotary Maternal and Child Health Ambassadors in Districts- some Master trainers will be chosen to take on a role ensuring continuing responsibility and support for Rotary Mother and Child care in all the Districts covering a target area. The Ambassadors will be given resources needed for training and retraining, and be recognised by local Rotary Club and District as alumni. 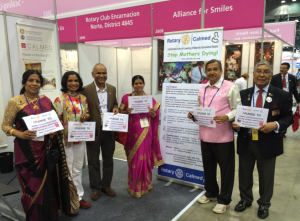 They will be invited to join appropriate Rotary Fellowships and/or Rotarian Action Groups. A telemedicine setup can be used to mentor assist and inform maternal and child health specialists from the cadre of Master Trainers as above. Discussions are in place. Breakout on Sustainability – this was a good workshop too with a lot of interesting ides on impact measurement, monitoring and evaluation. The audience liked our slogan – sustainability is everyone’s business. Role of partnership with stakeholders including the Government ( National Health Mission – NHM) and NGOs was highlighted. Many examples were given. Calmed was acknowledged as a good model for sustainability and even enhanced impact in future years.. I have registered for the Atlanta Convention in 2017 – see you there!